Houston surges to No. 1 metro ranking by dominating the energy sector and landing huge tech deals. The Hess Corp. has signed a long-term lease to occupy the entire 844,763-sq.-ft. (78,478-sq.-m.) Discovery Tower office building in downtown Houston. ig Oil has long been the big money maker in Houston, but the largest city in Texas lured capital from many other industries in 2008, enough to capture the No. 1 metropolitan area ranking for corporate facility projects from Site Selection. With 179 corporate real estate deals last year, the 5.7-million-resident Houston area unseated three-year incumbent Chicago to take home the coveted honor. Texas' second largest market, Dallas-Fort Worth, finished No. 2 with 156 projects, while Chicago came in third with 138. "The dominant economic development story of the year was Houston's dramatic success in job creation," says Jeff Moseley, president and CEO of the Greater Houston Partnership. "From November 2007 to November 2008, Houston was the number one job creator in the entire U.S., according to the BLS [Bureau of Labor Statistics]." Houston's 2008 performance is even more remarkable considering that, in 2007, the city ranked fourth among all large U.S. metros, trailing Chicago, Cincinnati and St. Louis. Houston's international ties led to one of its biggest recruits of 2008, Vestas Wind Systems A/S. The Denmark-based company announced last June that it had selected Houston as the location for its new U.S. research center. The $25-million investment creates 148 jobs in wind turbine R&D. With more than 35,000 wind turbines installed in 63 countries, Vestas leads the world in wind energy production. 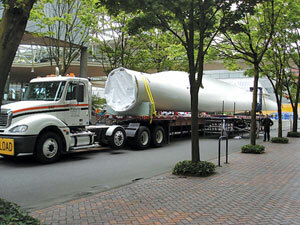 As of 2007, the firm had captured 23 percent of the global wind market. Wally Lafferty, vice president of technology R&D for Vestas Americas, tells Site Selection that Houston was the logical choice for many reasons. "Houston provides a very unique crossroad between offshore technology and aerospace," he says. "With NASA in Houston and with Boeing, Lockheed Martin and Bell Helicopter in Dallas-Fort Worth, there are a lot of heavy hitters in Texas. Also, Texas A&M is very close by and has large departments in various energy sectors. And, as everyone knows, Houston is the energy capital of the country." incinnati, Columbus and Cleveland weren't the only cities contributing to Ohio's "three-peat" in the Governor's Cup for 2008. While each of the Buckeye State's "Big Three" ranked in the top 10 among all large metropolitan areas in the U.S., several smaller Ohio communities proved their mettle as well. 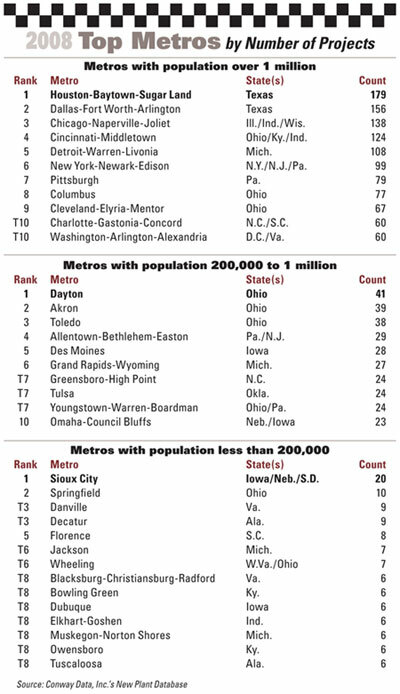 Led by first-time winner Dayton, the state of Ohio placed four cities in the top 10 among all metro areas with populations between 200,000 and 1 million. According to the Conway Data New Plant Database, the corporate facility tracking service of Site Selection, Dayton ranked No. 1 among all second-tier metros with 41 projects in 2008. Akron and Toledo assured a historic sweep of the medals by capturing silver and bronze, respectively. Akron tallied 39 deals, while Toledo secured 38. Youngstown tied for seventh with 24 projects last year. RevWires LLC is a startup company that's building a 90,000-sq.-ft. (8,361-sq.-m.) factory in Troy in the metro area of Dayton, Ohio. "As a location for doing business, the Dayton area makes perfect sense," says Andy Blanchard, founder and CEO of RevWires LLC, a startup that is building a $5-million, 90,000-sq.-ft. (8,361-sq.-m.) factory in Troy. "The state has been more than generous in terms of an incentive package courting me to build a business in the Dayton area. That was important to me as a startup. They gave me access to loans and other funding." The cored welding wire plant expects to hire 80 workers, making an average wage of $26 to $29 an hour, over five years, says Blanchard. "I worked with folks in the Ohio Department of Development, the City of Troy and the Dayton Development Coalition to create a package of incentives that allow me to have the cost structure I need to enter a mature market. That is even more important now, given the state of our economy." Blanchard also cited the "excellent transportation corridors of Interstates 75 and 70 that help me get my product out to my customers very efficiently." He likes the early response he's received from the local work force. "I ran a help-wanted ad in the local paper over a weekend in late October, and I was absolutely overwhelmed. I must have received over a thousand resumes in response to that ad. People here are eager to get on board." Blanchard has raised about $14 million for his venture, mostly from other local business leaders. "They take a lot of pride in helping to bring a brand new business to the area, stimulate the local economy and create jobs," he says. Jim Leftwich, president and CEO of the Dayton Development Coalition, says that Blanchard and his investors are typical of the local business community. "The collaboration of everyone in this region is just unparalleled," says Leftwich. "The stakeholders are all working from a common vision and a common regional strategy. There is a commitment across the region to that vision, and as a result we can work quickly to put together a deal." Significant deals in the Dayton area last year included a $24-million data center in Kettering from Reynolds and Reynolds; a $17-million R&D and manufacturing plant in materials research in Xenia; and a computer systems plant in Beavercreek from CACI International, which is investing $10 million. "We are able to capitalize on linkages to the research that goes on at Wright Patterson Air Force Base, the University of Dayton, Wright State University and Central State University," says Leftwich. "Executives from outside the region are often surprised to learn about the intellectual capacity in the Dayton area. We have one of the highest rates of patents per capita in the country." After going through a challenging period in 2006, the Dayton area is rebounding well, Leftwich says. It didn't hurt that Texas leads the nation in installed wind energy capacity, noted Lafferty. "Texas is a state that knows how to get things done," he adds. "So much wind capacity is being generated in Texas because they have figured out how to get through the regulatory process. Cape Wind has been bogged down in Massachusetts for nine years. I can't see Texas letting that happen." Ultimately, says Lafferty, the business case for selecting Houston was overwhelming. "We are always looking for ways to lower the cost of energy for our customers and increase our product reliability," he says. "We want to increase the business case for our customers. In Houston, there is a lot of tacit knowledge about offshore technologies and aerospace. A lot of very positive influences are here." Energy investments dominated the news in Houston last year, as evidenced by the fact that six of the 10 largest capital investments in the metro area of nearly 9,000 square miles (23,310 sq. km.) occurred in either the energy or chemicals sectors. The largest by far was ConocoPhillips, which announced a $2-billion gasification plant in Sweeny, where 200 new jobs will be generated. The region's second-largest project came from Dow Chemical Co., which announced a $900-million investment in a new chlor-alkali plant in Freeport. Other top projects in metro Houston included Shintech's $800-million investment in a new chlor-alkali and vinyl-chloride monomer plant in Alvin and Valero's $412-million mild hydrocracker plant in Houston. "Big energy providers are continuing on their path of production," Moseley says. "Many of the energy companies began cutting their work force years ago, as a result of previous recessions, but this time we are seeing energy companies being much more strategic and more focused on the long run. Valero, in fact, may end up being the largest economic development initiative in the state of Texas." Logistics play a key role in corporate expansions as well, notes Moseley. "The Port of Houston ties our economy to a thousand other ports globally," he says. "The widening of the Panama Canal will add the super-cargo container vessel in 72 months and allow non-stop service from Houston to every major port in Asia." The Kansas City Southern Railway Co. is among the many firms positioning itself for a larger slice of the global trade pie in years to come. On Jan. 19, the company opened phase one of its KCS Intermodal Center in Rosenburg in Fort Bend County. The $300-million investment could grow to more than 13 million sq. ft. (1.2 million sq. m.) of industrial space and create 2,000 jobs in the Houston area upon full build-out. "KCS and its development partner [CenterPoint Properties] are in the final stages of negotiations to locate a major consumer products company at Rosenburg, who intends to develop a large regional distribution center," says Doniele Kane, associate vice president of corporate communications and community affairs for KCS. "The Rosenburg intermodal shipper facility is located on the newly rehabilitated line from Victoria to Rosenburg, which is slated to be operational in the second quarter of 2009." Vestas Wind Systems A/S announced a $25-million investment that creates 148 jobs in wind turbine R&D in Houston. Texas' position as the U.S. wind energy capital was a big factor in luring the Denmark-based firm to locate in the oil capital of America. Kane says the new line "will shorten the KSCR/KCS Mexico cross-border route by approximately 70 miles [113 km.] and eliminate the need for KCS to operate over nearly 160 miles [257 km.] of Union Pacific-controlled track, which is a heavily congested rail corridor." 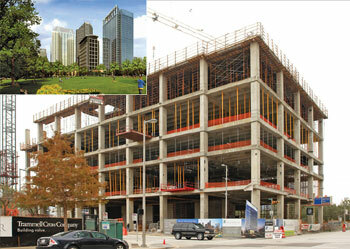 If the early part of 2009 is any indication, Houston could be in for another banner year of corporate projects. On Jan. 20, the Hess Corp. signed a long-term lease to occupy the entire 844,763-sq.-ft. (78,478-sq.-m.) Discovery Tower office building in downtown Houston. The 29-story facility will be the first LEED-Gold certified office building ever constructed in Houston's central business district. Construction began in March 2008 and is slated for completion in summer 2010. "This lease is one of the most significant leases signed in Houston over the past several years," said Aaron Thielhorn, principal of office development for Trammell Crow Co., at the time of the deal. "Not only are we able to deliver what will be one of the most recognizable buildings in Houston's skyline, but we are also fortunate to secure a company that contributes significantly to Houston's employee base and economy as the building's sole tenant." Mike Rosa, Vice President of Economic Development, Dallas Regional Chamber: "In all this economic hubbub, what has gotten lost a little bit is a philosophy of places. The metro areas that are going to be successful in this country are places where young, talented people want to be, not where they have to be. Those places are going to have an extra gravity and will have a chance to gain headquarters projects. This region is doing a good job of that." David Berzina, Executive Vice President of Economic Development, Fort Worth Chamber of Commerce: "We have built an infrastructure over two generations of leaders in four prime industrial parks. In this economy, if you don�t have a location that�s ready to go, you�re not going to win the battle." here's perhaps no better evidence of community support for economic development than when diverse interests band together to support the common good. That's exactly what happened last year when four companies decided to postpone their respective expansion announcements so that Nebraska Gov. Dave Heineman could be on hand to deliver the good news. 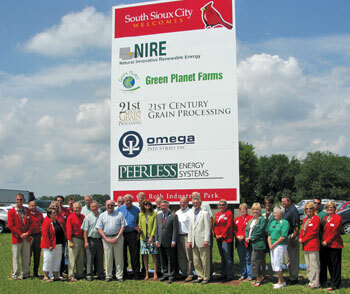 Executives of Peerless Energy, Omega Industries, 21st Century Grain and National Innovative Renewable Energy (NIRE) all came together at the Roth Industrial Park in South Sioux City, Neb., to watch the governor announce their plans to build new facilities. Those projects were four of the 20 expansion deals that propelled the tri-state area of Sioux City, Iowa-Neb.-S.D., to the No. 1 ranking among all U.S. metropolitan areas of less than 200,000 in population. Claiming its second consecutive win in the tier-three category of communities, Sioux City doubled the output of its closest competition –runner-up Springfield, Ohio, which had 10 corporate real estate deals in 2008. "When the governor came to make these project announcements, he said that South Sioux City is the economic development capital of the state of Nebraska right now," says Chris McGowan, executive vice president of economic development for the Siouxland Initiative. "We even kicked off that day in July with a ribbon-cutting at Green Planet Farms, a $40-million organic soybean processing plant located in the Roth Industrial Park. We went from that event to a groundbreaking for all these other projects." Click the play button above to view an interview with Ron Starner on Sioux City's second consecutive Top Metro award, originally broadcast by KTIV NewsChannel 4 in Sioux City, Iowa, on March 9, 2009. McGowan says that spirit of teamwork is not an aberration in the Siouxland region. "Every state and every community in our area had at least one project represented in our total of 20," he says. "All communities in the region contributed to this victory. That is really a huge part of the reason that we have been successful. We have three different state economic development incentive packages to present to prospects whenever they are considering our area, and that is a huge advantage." "For the past decade, we have been propelling our strategic vision for economic growth," says Debi Durham, president of both the Siouxland Initiative and the Siouxland Chamber of Commerce. "We made sure we had land sites that were both developed and certified. We made sure we had industrial parks and infrastructure. And we have been strategic in our marketing efforts." Durham says it's also crucial "that we understand who we are. Food processing is our foundation, and we have learned to play to that strength." In recent years, the area has also attracted large investments in bio-fuels, wind energy, data centers and customer contact centers. In 2008, seven area projects were either data centers or call centers.